The day started out overcast with rain threatening. We were following the Garmin “curvy roads” routing which took us through many small villages and narrow roads. It was kinda sad to see many of the towns are in serious disrepair. There are few young people and there are abandoned concrete structures along the roadway. In town you see old men (and by old, I mean much older than me) sitting on the sidewalk outside of cafes watching the traffic go by. No young people, no children. One of the nice things about two – wheeled adventures is that your sense of smell adds to the experience, immersing you in the environment. Coming into one of villages I could smell mold, soon after I smelled sulfur. 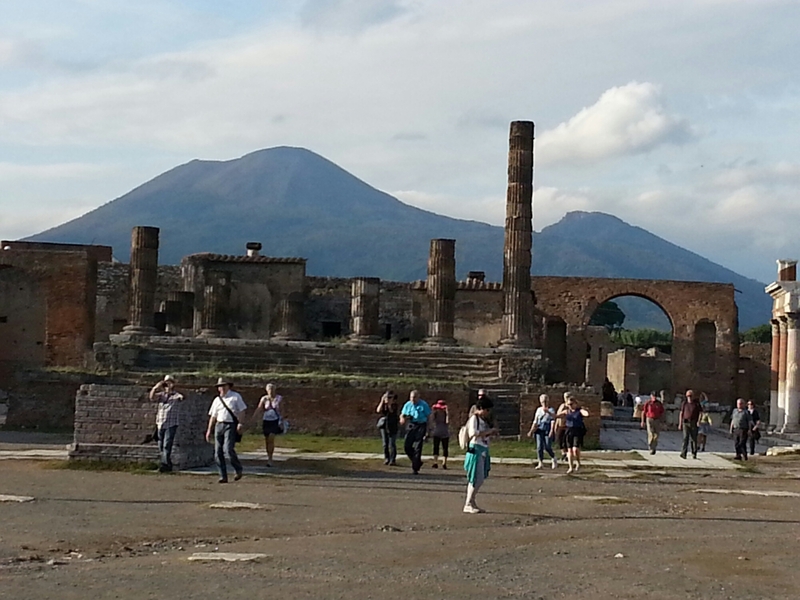 It appeared that this area was once a mineral springs resort area, taking advantage of the natural heat from Vesuvius. Most of the buildings were shells. Again, kinda sad. As we came into one of the larger towns it started to rain steadily. We liked fire refuge at a cafe only to discover out was closed. Across the street was a nightclub/restaurant named Blue Fever. Unfortunately, it only served desserts during the day. Josef used his charm with the servers, Ramona and Maria, and convinced them to contact another shop to bring lunch to us. What showed up was a platter of sandwiches, pizza, bread, cheese and more that could easily feed ten. Apparently, we were the only patrons on town. We ate on the dance floor with music videos playing on a big screen. Rather surreal and over the top. By the time we finished, the rain had stopped and we continued towards Naples. Naples is a huge metropolis with stifling traffic and roads constructed with manhole cover sized slabs of dark stone. They were anything but level and there were no lane markings whatsoever, resulting in a free – for – all. Our adventure style bikes were bouncing all over as we tried to stay upright, avoid the swarming scooters and random pedestrians. This made Rome look tame, and it went on forever. 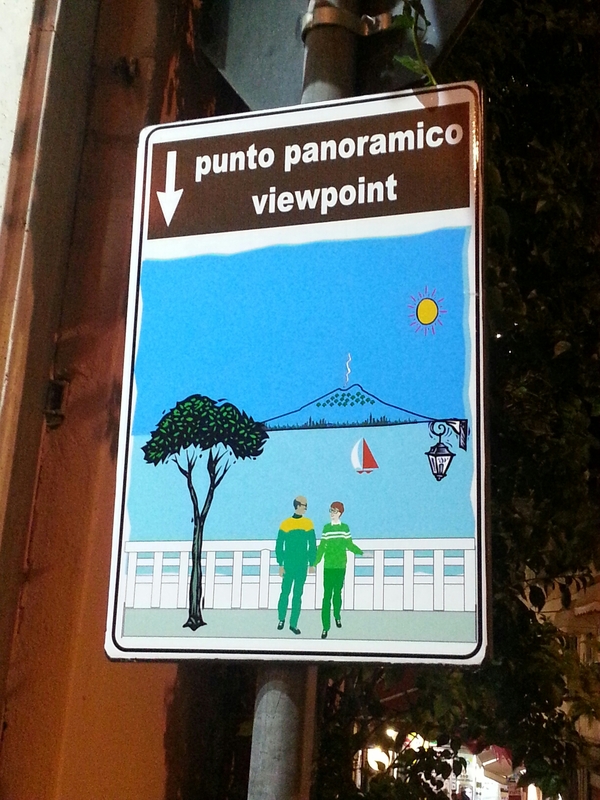 Finally, we caught site of signage for Pompei, our next destination. I recognized the entrance, as we rode past it, another U- turn. We spent about two hours wandering the grounds with me trying to recall the details from our visit a few years ago. 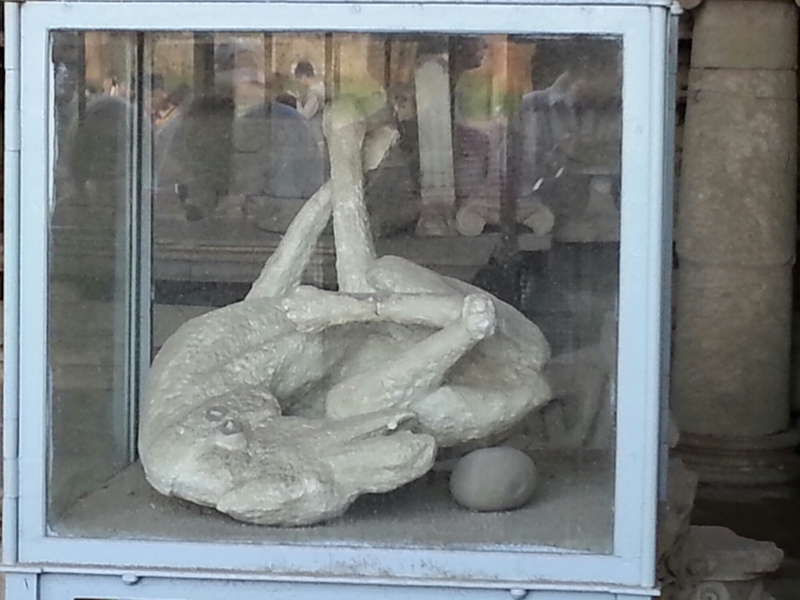 What happens to dogs that bark too much in Pompeii. That’s Vesuvius in the background. Imagine it without the top blown off. 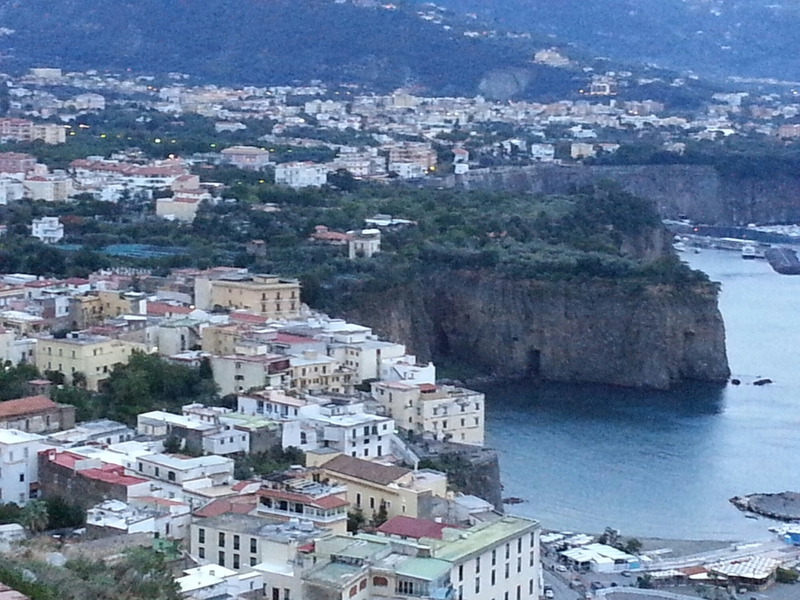 Our final destination was the Amalfi coast. We were a little anxious because our German friends had told stories of terrible traffic and we didn’t have a lot of time to get to our hotel in Sorrento. It was dusk as we approached the coast roadway. It is indeed spectacular. 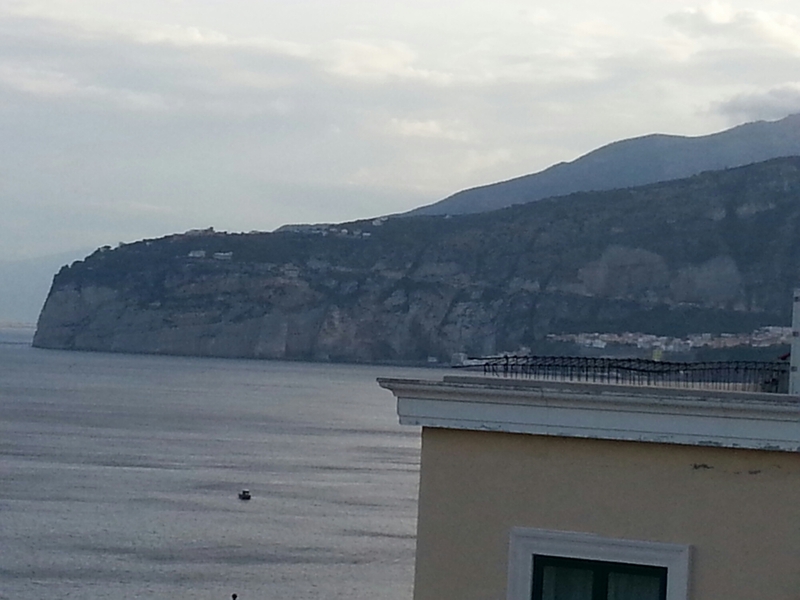 Sorrento had its own brand of traffic insanity. Scooters buzz on and over the center line, passing between buses and playing chicken with oncoming traffic. I can’t begin to describe the mayhem. Trying to keep the four of us together for the few kilometers turned out to be impossible. Guess who got left for dead? I went the wrong way down a one way street, got chewed out (deservedly) by a traffic cop, got bad directions from a shop owner, got worse help from another traffic cop and found the hotel by a combination of dead reckoning and dumb luck. The Hotel Regina is on the cliff overlooking the water. Close by is an outlook identified by this sign, nice. Tomorrow, we’ll follow the coast south and then turn inland to make our way back to Rome Friday.